Buy your Maglite adapter kit and Maglite solvent trap kit products at Infinite Product Solutions. Maglite is one of the most trusted names in flashlights, and for good reason. Not only do these devices provide incredible LED illumination, but they’re also made from some of the toughest materials out there. Police and everyday citizens have even been known to use Maglite flashlights as makeshift batons when needed. Perhaps that’s why Maglite solvent trap kit products are so popular. When you’re cleaning corrosive impurities from inside the barrel of your firearm, you need to ensure that those deposits will be trapped inside a cylinder that can contain the most abrasive acids and minerals. But of course, a flashlight solvent trap isn’t simply going to attach itself to your barrel. You’re going to need the appropriate Maglite solvent trap adapter kit to establish a good fit. Before you choose a flashlight solvent trap adapter, you will need to determine the appropriate size. Maglite thread adapter products are unique in the world of solvent traps because they don’t adhere to the traditional thread sizes that you would find with an oil filter, fuel filter, or other solvent trap. To find the perfect fit for your Maglite thread adapter, you will need to determine the battery size. For instance, the C-cell Maglite has a different circumference thanthe D-cell Maglite, and so they won’t work with the same Maglite adapter. Use the battery size as a guide to determine the appropriate Maglite adapter kit that you’ll need, and then ensure that the adapter corresponds to the thread size of your gun barrel. For instance, if your barrel uses the common ½-28 thread size, and your Maglite solvent trap adapter uses a C-cell battery, you’ll need a ½-28 to C Cell Maglite adapter kit. Then you can attach your flashlight to your barrel with ease.Our comprehensive Thread Reference Guide includes a handy chart that covers all common American Standard Threads. The Maglite solvent trap kit is inexpensive and provides all the properties needed for an effective solvent trap: durability, ample size, and a cylindrical fit that works well with standard gun barrels. At Infinite Product Solutions, we not only have all the common sizes for flashlight solvent trap adapter products, but we also have a wide range of colors to suit your personal preferences. Choose from an attractive variety of Maglite solvent trap adapter kits including purple, green, gold, red, and black, and discover how easy it is to achieve a good fit on the end of your barrel. Order your Flashlight Solvent Trap AdapterKit Now! 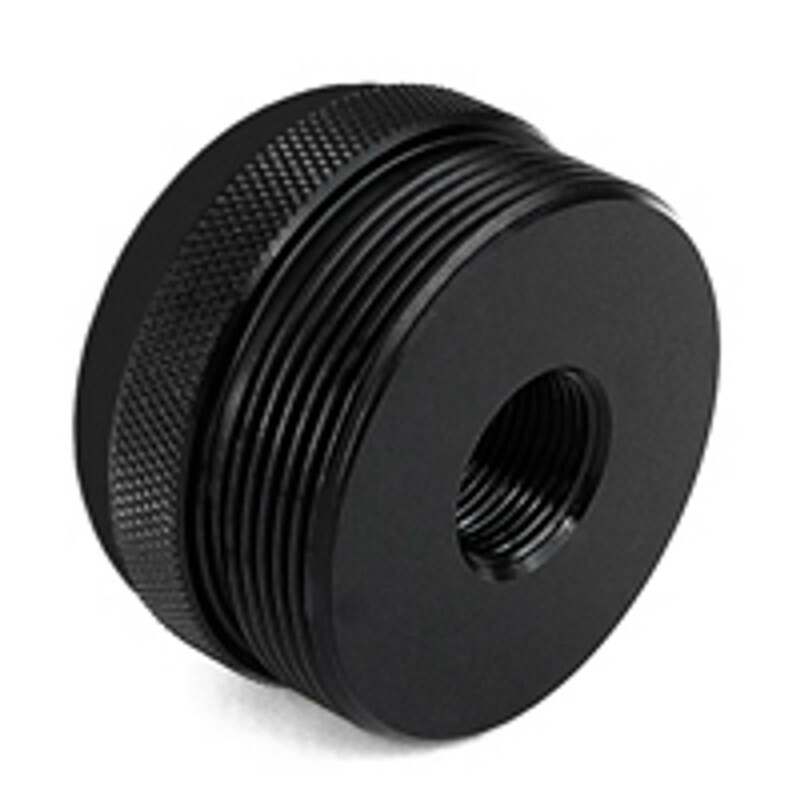 At Infinite Product Solutions, we carry only the highest quality thread adapters, including Maglite solvent trap adapter kits, and we offer them at extremely competitive prices. We’re passionate about the barrel thread adapterproducts we sell, and we only offer those that conform to our high standards. If you need recommendations, or if you have any questions about our inventory, please feel free to reach out to us at any time. One of our friendly and knowledgeable customer service representatives will be happy to work with you. Explore our full selection of flashlight solvent trap adapter kits, and save money with Infinite Product Solutions. To view all of our exceptional barrel thread adapter products take a look at our online catalog. Based out of Corona, California, Infinite Product Solutions has been manufacturing custom barrel thread adapter products for nearly a decade. Along with our Maglite thread adapter kits you will also find a great selection of barrel thread protectors, muzzle brakes, gun cleaning kits. To learn more about our company, or if you still have a question about any of our Maglite thread adapter kits, please send us an email, fill out our online contact us form, or call our experts at 1-951-220-7948.